Musicians of all levels have a tendency to outgrow their pedalboards. This can lead to a number problems like cable management, pedal chain priority, and the obnoxious need to hop around end-to-end of your board to dial-in the right set of stomps. One solution to tame the constant pedal tap dancing beast lies in a new wave of compact devices which bypass your pedals in and out of the signal chain from a centralized location. With companies picking up on this trend, there are now an overwhelming amount of choices for True Bypass Loopers that range from simple and compact to fully programmable with more bells and whistles than your large-box Strymon. Whatever your needs may be, these devices help musicians spend less time worrying about pedal switching and more time creating new sounds. Programmable presets: This gives you the ability to store and recall multiple combinations of audio loops creating a “seamless switching” effect. Midi messages: There are two types of midi messages: Program Change (PC) and Continuous Control (CC). Both you give avenues to adjust different parameters of some effects. Using the Strymon Timeline as an example, you can send midi PC’s to control preset changes and midi CC’s to control the advanced looper controls. A/B switching: Like lots of simple A/B switches, this convenient feature is including in many looper devices and allows users to plug their amps into a dedicated output. By using a preset you can use amp A or B or both. Buffered loops: When using lots of long cables to and from effects units or amps, the buffered loops can combat noise and signal loss. The disadvantage is some pedals (especially fuzzes) don’t play nicely with buffers and can ruin the party for everyone. Isolated tuner output: A dedicated tuner output allows for users to keep their tuners on at all times. When audio loopers have this function it usually means there is a mute switch that allows silent tuning. Relay controls: Using a TRS (Tip-Ring-Sleeve/Stereo Cable) with the relay controls allows for additional manipulation for amp channel switching and other device control. Now that you have a sense of which features to look for, here are just some of the options out there to consider when looking for a true bypass looping solution. Loop-Master Switching Solutions makes a variety of true bypass audio loops including single, ABY and even an 18 Looper Bypass strip. You can use these to turn on one or multiple effects at the same time. True bypass loopers like this are extremely useful when incorporating older effects into the signal which can produce unwanted tone coloration and noise into the path. A true bypass loop is a great introduction to the world of bypass loops and Loop-Master makes a variety of inexpensive solution for any type of musician. 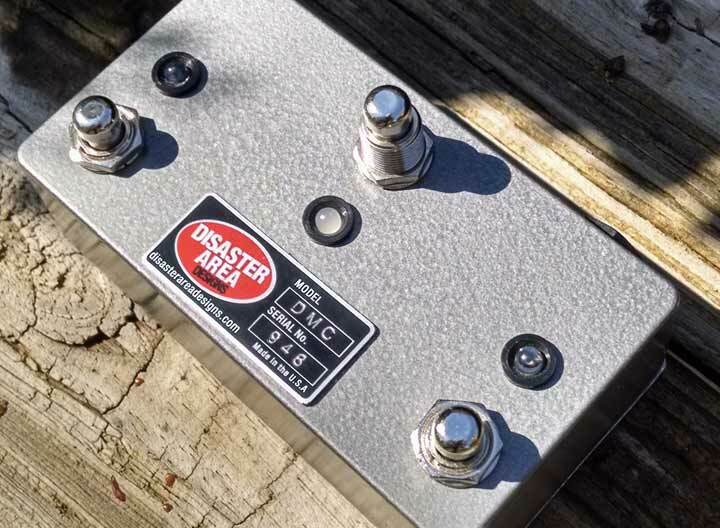 In 2010, amid the demand for Line 6 m9 looper controllers, a mad scientist by the name of Matthew Farrow of Disaster Area Designs began developing the DMC as a compact way to instantly access the looper function in the m9 and m13. Flash-forward to 2015 and the DMC controller, now in its 2nd generation, has inspired a line of products that help musicians simplify their rigs as well as obtain maximum control over their gear. The DPC Programmable Switchers offer musicians a pedalboard-friendly system with true bypass loops as well as amp, device and midi control. One of the most unique features about Disaster Area Designs is that all their products are modular and work together extremely well. Don’t hesitate to get in contact with the Disaster Area Designs team for all types of rig solutions. 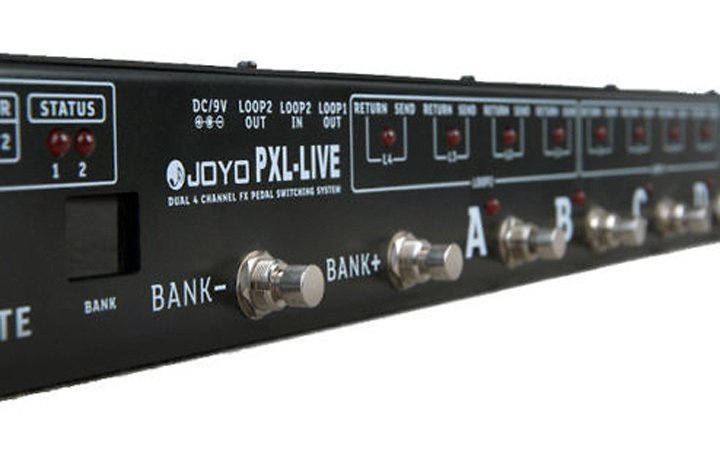 With the success of the PXL 8 and PXL Live, Joyo released a midi version of their inexpensive programmable loop system. Boasting 8 true bypass loops, 2 trigger function relays (for amp switching or controlling certain pedal functions) and the ability to send both midi CC and midi PC signals, this is a no brainer for the musician with a planned set list who wants to get away from the risky business of involved pedal tapping all night. With the “dual 4 channel loop design” musicians using their amps effects loop can also take advantage of programmable presets by organizing the preamp pedals for loops 1-4 and effects loop pedals for 5-8. A great additional feature of the PXL Live is that the midi CC and PC functions can send messages to computer recording software, allowing control for live looping (via Ableton, for example) and recording. Back in 1982, Boss released the SCC-700 Sound Control Center. This was a revolutionary idea paving the way for both multi-effect units and programmable bypass loopers. 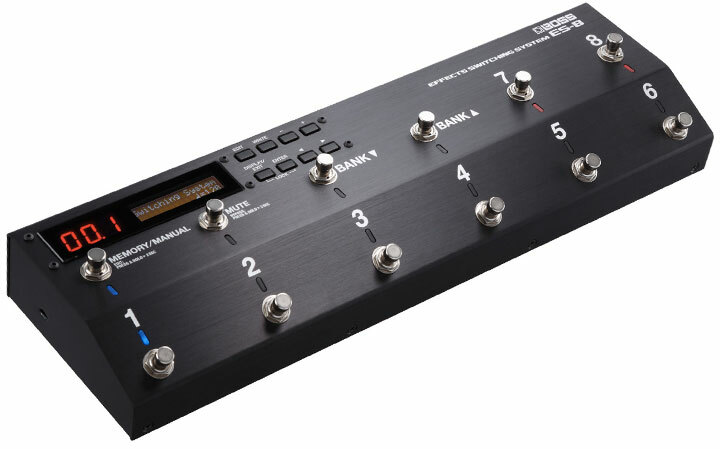 Jump ahead to January 2015 at NAMM where Boss announced the ES8 Effects Switcher. This updated version of the Sound Control Center packs 8 (7 mono 1 stereo) loops, 2 expression pedal inputs and 3 control inserts for adding accessories like the FS-7 for tap tempo and amp channel switching. If that’s not enough, the ES8 has individual loops that can be routing any way you want. No need to plug and unplug cables to test effect orders, with this unit you can easily switch effects and even create parallel chains. With each effect loop you have the option for a buffered bypass, which is a great addition for musicians using fuzzes that don't respond well to buffers. Without a doubt, the ES8 sets a new level for programmable effects switchers. 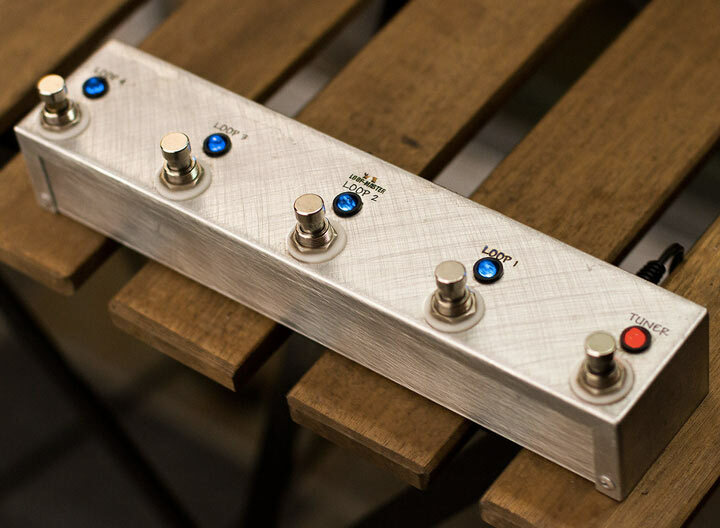 This unit is an easy way to explore endless pedal combinations and signal chains without having to invest in 4 or 5 units. For years the Voodoo Lab GCX Audio Switcher has been an integral part of countless musicians' rigs. 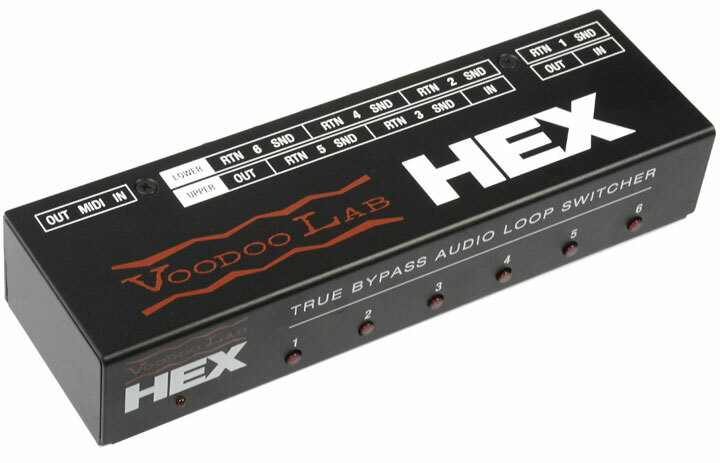 For those musicians that already own a midi footswitch and want an easy transition to a pedalboard friendly loop switcher, the Voodoo Lab Hex is the perfect solution. The Hex has an incredibly small footprint, with the ability to mount under most Pedaltrain pedalboards. With the ability to combine multiple Hex units, users have unlimited control over the amount of audio loops they want. As long as you have the space, you can add however many units you need. And if you decide one day you want to go back to a rack-mounted setup, the Voodoo Lab Hex can be easily attached to a rackmounted bracket. For those of you not wanting a 2-in-1 programmable looper with footswitches, the Hex is a great solution for both pedalboard and rack setups.